Having determined that the situation in Burundi continued to constitute a threat to international peace and security in the region and acting under Chapter VII of the UN Charter, the Security Council, by its resolution 1545 of 21 May 2004, decided to establish the United Nations Operation in Burundi (ONUB) in order to support and help to implement the efforts undertaken by Burundians to restore lasting peace and bring about national reconciliation, as provided under the Arusha Agreement. ONUB successfully completed its mandate on 31 December 2006. It was succeeded by the United Nations Integrated Office in Burundi (BINUB), established by Security Council resolution 1719 of 25 October 2006. 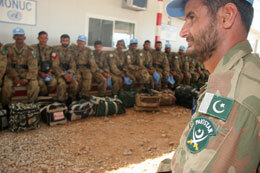 Peacekeepers from Pakistan wait at the Bujumbura International Airport for their flight back home at the end of their tour of duty with ONUB, Bujumbura, Burundi, 23 September 2006.